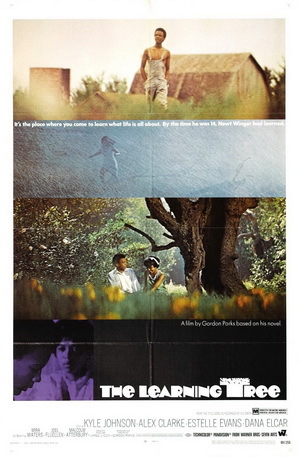 The Learning Tree (1969) and Hollywood’s First Black Director, Gordon Parks. By the 1950s, African-Americans had virtually vanished from prominent film making positions. Films about black life starring black actors were still being churned out by major studios, but the simultaneous ending of Michaeux and Williams’ career meant that authentic representations of black life in America was absent from the screen, leaving the topic to be interpreted by outsiders. Norman Jewison’s In the Heat of the Night touched on this absence through Virgil Tibbs, a black cop solving a crime in racially divided Mississippi. Although Tibbs was a groundbreaking character that broke stereotypes and showcased a usually unseen realism, In the Heat of the Night only scratched the surface of the racial tensions boiling around the planet, leaving Gordon Park’s triumphant debut, The Learning Tree, two years later to break the ice in the topic of race in America. The Learning Tree is an allegory for Fort Scott, Kansas in which a young African-American must learn of both the good and bad fruits his hometown has to deliver. Based on his autobiography of the same name, Parks’ inclination into becoming the first black director of a major studio film happened through the helping hands of actor and independent filmmaker, John Cassavetes. Although Parks was already well-established as a renowned photographer for “Life” magazine and had two novels under his belt, he had never made a motion picture before. During an interview with S. Torriano and Venise Berry, Parks mentions how offers to turn his bestselling novel into a film came in droves with some even suggesting he change the character’s race to which Parks continually denied. Having just read The Learning Tree, Cassavetes put Parks in contact with Kenny Hyman, whose father ran Warner Brothers/Steven Arts. Hyman offered Parks the opportunity to not only direct his own film, but act as screenwriter, music composer, and producer which ensured Parks full creative control over his material and stapling Parks place in history. Through the eyes of 15-year old Newt Winger audiences witness the social relationships between the races within Kansas during the 1920s. While Newt is coming of age and the seasons change, so does his skin of boyish naivety. Encircled by a close group of friends and his girlfriend, Newt begins searching for simple answers in life after witnessing the death of an acquaintance. But with time, Newt discovers that existence is a much more complex and difficult element to fully understand. Soon he learns of the joys and pains in life from love, to loss, to death, and the harsh realities for people of color. Parks weaves an extraordinarily, intricate tapestry that delves into themes of coming of age along with racial injustice and its psychological effects. Parks’ narrative explores the mindset of Americans in a post-reconstruction society entering a new phase of American life. In one scene, the preacher of Newt’s church begs the Lord in prayer to save the congregation from flapper dresses and its lifestyle, an intriguing view into the fear present among rural Christians who feared that the sin of newly emerging urban life would affect the moral fabric of the country. Parks also presents us the viewpoint into the general “us vs. them” mentality had among blacks and whites at the time. A notably poignant moment of the film happens when Newt hangs around after class to argue a “C” on a paper that he felt should have been higher. His conversation with his teacher proves just how inbred racial stereotypes are and how prejudice is a learned behavior when she expresses earnest disappointment that Newt is “wasting his time and money” attempting to go to college. The fact, in her words and belief system, is that his only options are to become a porter or server. Newt’s principal delivers a heartening yet stinging blow by declaring Newt’s teacher’s way of thinking is owed to her upbringing, as the case for millions others. But despite this, Newt is reminded that as a black man in society, his must show respect even for those who don’t respect him. The cyclical pattern of learned behavior is further explored through the character Marcus. A former friend of Newt’s, Marcus’ folly in life is that he does not know how to break the cycle of negativity that he’s been nurtured in. Marcus is motherless and raised by his alcoholic, illiterate father, a man with whom Marcus has so much animosity for that at point he would rather walk outside during a tornado than stay in with him. Yet, Marcus’ anger and hate creates a shell of prideful shame that results in fiery bouts of rage which land Marcus in a detention center for six months. While Newt and his friends grow into their young adulthood, Marcus grows in the system of prison being taunted and beaten by white prison guards who continually demean and mock him and his race. The physical and verbal abuse scares Marcus and the wall he puts up to protect himself results in tragedy. Parks’ elaborate story is only made more vibrate through his unique use of match cuts to edit elapsed moments in time and piece together scenes. A set of praying hands, a hung picture, and the wings of a butterfly are just some of the images used to switch the focus of a scene, which transports viewers into alternate time and areas of space for the story to continue. Parks also showcases his keen eye for artistic angles and aesthetically pleasing modes of capturing moments. Parks heavily utilizes long shots in The Learning Tree which gives way to a breathtaking scene in which characters meet in front of a sunset. The sun appears to nearly engulf them in its impenetrable radiant hue and their bodies become silhouettes engaging with one another before getting on their horses and riding away from the sun. Through these long takes Parks takes advantage of long zooms that open and close a scene with a faint, airy touch. The Learning Tree is an incredible piece of narrative that not only reverberates black experiences, but teaches elements of it, however, it is not a perfect film by any means. In fact, it’s blatantly obvious throughout that The Learning Tree is a debut effort. While its production value lends itself to a high quality of filmmaking which reflects in its tonality of picture and for the most part sound, the story is a bit weak and at times gets weighed down in its own melodrama. At times, the delivery of lines is awkward calling more attention than needed to lead actor Kyle Johnson’s second-rate talent. Regardless, The Learning Tree holds up as a powerful story that occasionally reminded me of HBO’s masterpiece “The Wire.” In five seasons “The Wire” shows what Gordon Parks summarizes in The Learning Tree; the complex nature of economic, political, and social justices that are rooted in the construct of race. The Learning Tree relays that while we are all bound together by our genetic makeup, we have separated ourselves because of the differences of our skin.